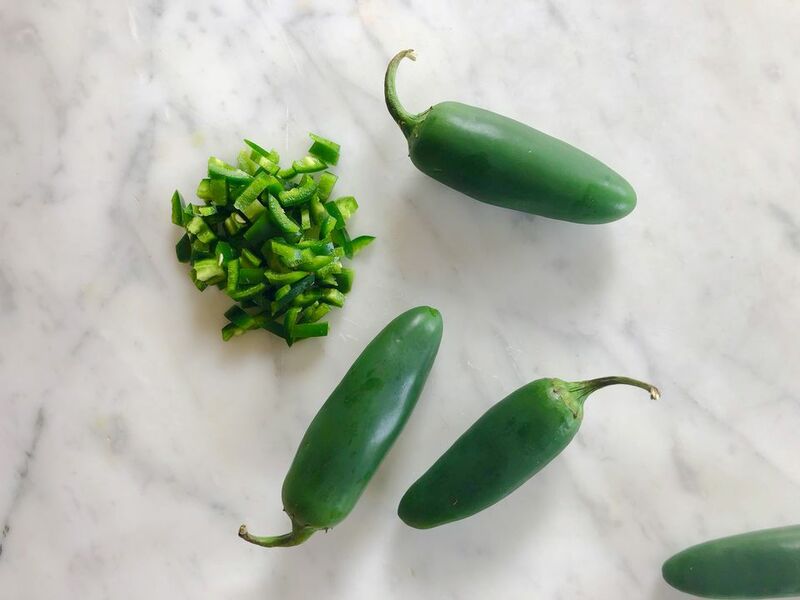 Here, we're working with jalapeños, but this method works for any fresh chile or pepper. Of course, super small chiles are easier to just chop up, seeds and all, but this method works with them, too, just use a small paring knife in that case. No matter what kind of chiles you're using, look for plump, firm chiles with smooth skins. Even chiles with lots of ridges, such as habaneros, should have smooth skin. Soft, bruised, or browning chiles are best to be avoided. 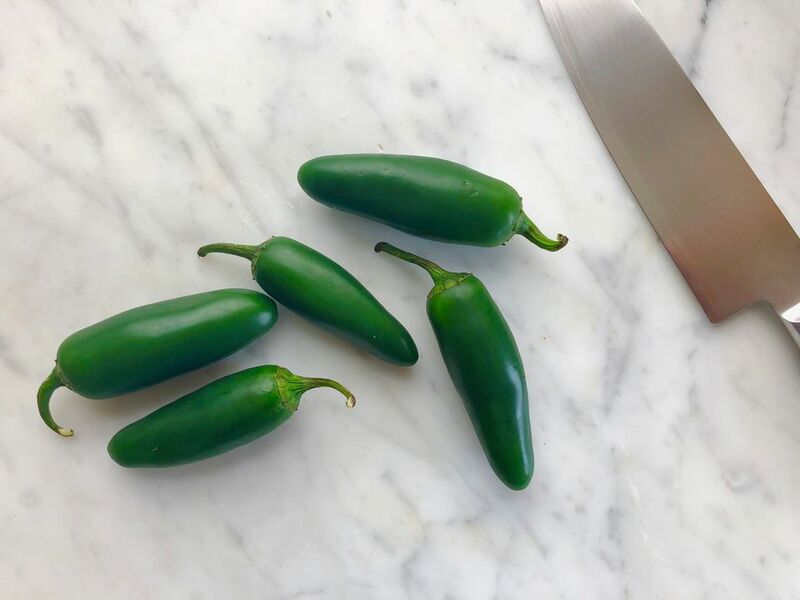 Tip: While the method for cutting chiles that follows definitely minimizes the amount of contact your fingers have with the cut chiles, always be aware that the capsaicin, which is what makes chiles spicy, will get on your hands. Wash your hands thoroughly after working with chiles. If you're sensitive to chile oil, avoid touching your eyes, lips, and other sensitive areas for at least an hour afterward to avoid unpleasant, even painful, burning. If you do find yourself with a burning sensation, know that yogurt is a great cooling agent. If you'd like to forgo handling the chile with no barrier, we recommend buying some food-safe rubber gloves, which can be found at some supermarkets. By sacrificing a small section of the pointy tip, you create a flat surface that will make seeding and cutting the rest of the chile much quicker and easier. Use a sharp knife to cut off just enough of the pointy end of the chile to create a flat surface. It may seem a little weird, but standing the chile on its brand-new flat surface will make the next step easier and it makes the chile a little more stable and easier to hold in place as you cut. Stand the chile on the flat surface newly created by having cut off the tip. Holding the chile steady by grabbing the base of the stem, use a sharp knife to cut down along one of the sides of the chile, cutting a strip of flesh straight down the side of the chile. Ideally, the seeds will stay attached to the core in the middle of the chile. Repeat step 4 all around the entire chile so you have a small pile of chile strips on one side and the stem, core, and seeds on the other. Discard the stem, core, and seeds. If you're chopping more than one chile, repeat steps 2 through 5 with all of the chiles before moving onto step 6. If you want smaller pieces, you can first cut the chile slices lengthwise into thinner slices. However thick or thin the slices, stack them into a pile, hold them steady, and chop them crosswise. You should be able to work with 1 to 2 chiles worth of slices at a time.